Congratulations to Rodney Goggins who, quite remarkably didn’t lose a single frame all week-end! MOSCONI CUP LEGEND JOINS THE WORLD SENIORS SNOOKER TOUR! 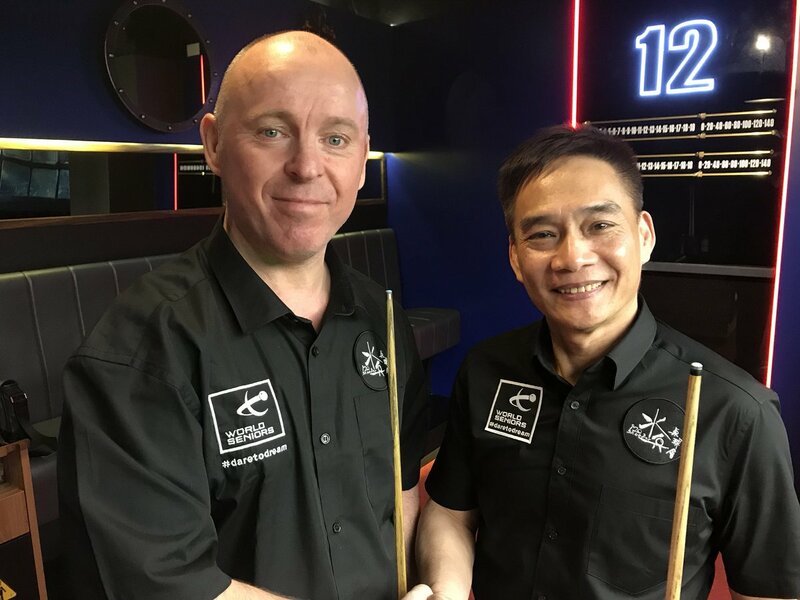 Former European number 1 Nine Ball Pool Player, and Three time Mosconi Cup Winner, Mark Gray is the latest over 40 cue sports player to ‘dare to dream’ on the World Seniors Snooker Tour. Mark said “I never thought I would play snooker again but then one day down at my local club Brian Corr and Pete Odel both mentioned I should give it a go. At first I thought they were joking, but hey here i am and going to give it a go! Mark lines up at Scotties in Liverpool between the 5th and 7th October and will find out tomorrow who he plays when the draw is made. Should he win he will join the likes of Hendry, White and Parrott at the Uk Snooker Championships in Hull between the 23rd and 25th October. The first qualifying event for the UK Championship takes place this week-en in the i20 Club in Hong Kong. Although one of them at least was made to work… it’s only fitting that “the shirt” is ironing for once instead of being ironed. There are a number of Thai players involved in the draw, and Noppon Saengkham came to support them, and the event, which is great! I’m not too sure to understand the “second runner-up” concept but those trophies look beautiful! Not sure if this is a thermos bottle (for the long nights) or a sport bottle (Jason you should get fitter maybe? ) but it’s a nice touch. Congratulations to Suchakree Poomjang from Thailand, your winner. See you in Hull! You can (re-)watch the final here. Although the next event is the UK Championship Qualifiers 1 in Hong Kong, the draw and format are already available for the next one, in Clacton to be played on the last week-end of September. And don’t forget … here is what awaits those who qualify! These changes were discussed by tour players on their forum and received unanimous support from those who commented. We will continue to work with our players to improve the tour for all those concerned. This is indeed good news and further incentive for players to enter and try on the World Seniors Tour. It’s also great to see that the forum is effectively a place where the players can express their concerns and wishes AND are actually listened to. WORLD CHAMPS Q1 NEWBURY HAS 10 PLACES LEFT, IT WILL CLOSE WHEN THEY ARE TAKEN.